Get Make Plus Developer now →. Responsive design – Beautifully responsive on any screen or device, you won’t have to worry about losing clients or customers due to mobilegeddon. Action & filter hooks – Action and filter hooks, complete with documentation, make it easy for developers to expand and customize Make sites for their clients. Ready-made child theme – Download and install a ready-made child theme for your Make site. Save your customizations while ensuring your site is up to date with the latest Make release. Sass files included – We have Sass files for you, in case coding the CSS by hand isn’t your style. Make also comes with native styling for and integration with Contact Form 7, Gravity Forms, WooCommerce, Easy Digital Downloads, Postmatic, and the official Twitter plugin. 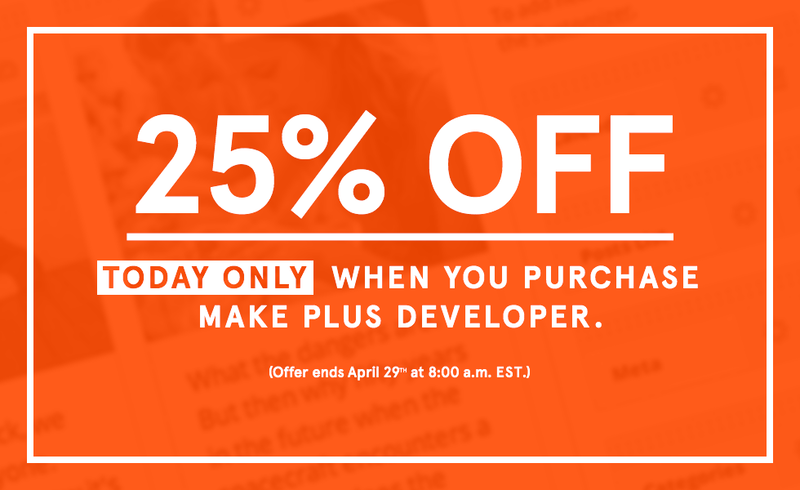 We hope you’ll consider adding Make Plus to your developer’s toolkit, and we’d like to extend a 25% discount on a year of Make Plus Developer.